The campground area used for events is only a small part of Wisteria’s 620 acres. Do not stray from the clearly marked event areas shown on the map. Other areas of the land are off limits because they are private sites, rugged terrain or are part of the wildlife habitat/nature preserve areas. 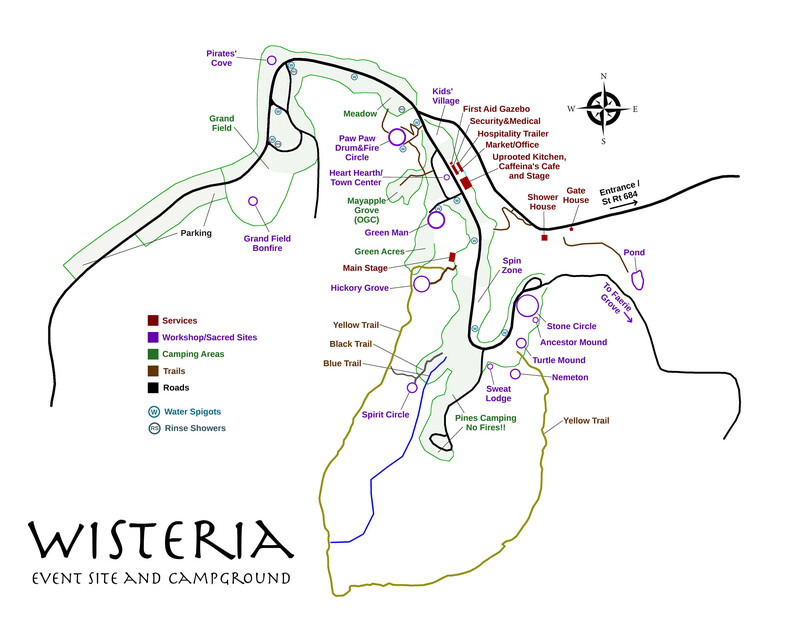 Wisteria land has many cliffs and ravines and other natural features. Loose footing on unfamiliar ground can result in catastrophe. Most camping at Wisteria is primitive tent camping. Please take good care of your campsites and practice Leave No Trace principles, removing all ropes and cleaning up trash when you leave. Please use light-colored marking material to flag your ropes and tent stakes. Be aware that centrally located areas may be noisy well into the night; for a quieter camping experience, consider remote woods camping in the Pines. For a full list of campground rules and regulations, see our Campground Rules page. If you are camping in your vehicle or wish to keep it parked at your campsite, you will need a parking pass. To avoid damage to our roads and land, please do not drive once you have unpacked and parked your car. Camper vans and recreational vehicles are permitted, but there are no septic, water or electrical hookups. You may be directed to a designated location for RVs. Please do not bring motorized vehicles for driving on-site. Bicycles are encouraged. Bicycle travel may be temporarily restricted when campground roads are wet. Staff vehicles (such as utility vehicles and golf carts) will be operating throughout the event, and golf cart bus service may be available at some events. Kids are welcome! Kids under 3 are free, but we’ll need to register them. Kids age 3 and up will need tickets. During our events, discounted rates are available for children 3-12. Please note, all attendees under 18 will need to have a responsible adult on site at all times. If the responsible adult is not the child’s parent or legal guardian, you will need a Parental Permission Form signed by the parent/guardian for each minor child present without a parent or legal guardian. Contact info@wisteria.org for more information on guardians and what is required. Please be considerate when using cell phones and radios. Many enjoy being unplugged for the week and do not welcome the intrusion of the outside world. Cell phone signals are improving all the time. WiFi Internet is currently available in the Town Square region (around the Market and Pavilion). Insect repellent may be needed to repel mosquitoes in wetter months. Check your body daily for ticks. Keep food stored securely with lids to discourage raccoons, ants, and other creatures from visiting camp. Be careful around wood piles and downed trees, as these may be habitats for wildlife. Please treat all local wildlife and insects with respect and remain calm if you have encounters. if you are concerned about an encounter please contact Wisteria Security for assistance, so that no harm comes to campers or resident wildlife. 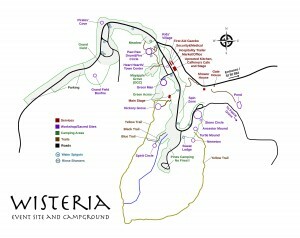 Wisteria is a rustic licensed campground and may not be suitable depending on your condition and level of mobility. If you have special needs, please call us prior to registering to see if we can accommodate your needs. Those with highly specialized diets need to provide for themselves rather than depend on the food vendors. Bring your medications and take them as directed. Firewood is sold near Caffeina’s Coffee House for $10 a cartload. Carts are available. To avoid infestation from invasive insects, do not bring in firewood from other areas! No firewood is to be harvested from the forests of Wisteria, except for small dead twigs and branches. DO NOT dig fire pits. A limited number of community fire rings are available for sharing. D not leave unattended fires burning (this includes lamps and candles). In wooded camping sections, use only established fire rings and circles. Absolutely no fires in the pine forest!!! Should a fire get out of hand, immediately shout for help, and call security on duty. Fire extinguishers are available at Caffeina’s Cafe and throughout the campground on poles underneath RED fire buckets. Keep water handy near fires. Please use caution when kindling fires of any size, and be careful with candles, torches and cigarettes. The Wisteria staff uses FRS radios to communicate and keep the event running smoothly. If your party uses these radios, please use only even-numbered channels and reserve the odd-numbered channels for staff use. During events run by other organizations, please channels used by either Wisteria staff or their organization staff. Potable water is available throughout the campground from frost-proof hydrants with blue handles. Please note, these are water hydrants, not pumps! Use the small green spigot valves to obtain water; do not attempt to use the large blue handles (they will be taped or locked open throughout summer events). You may attach a hose only if you provide a tee and vacuum breaker. RV / Camper water hookups are not permitted. Greywater in the campground is treated by a constructed wetland. To ensure its continued health, please avoid using phosphate-containing soaps or shampoos.